Need a last minute Valentine’s Day Box that is unique and inexpensive? Look no further! 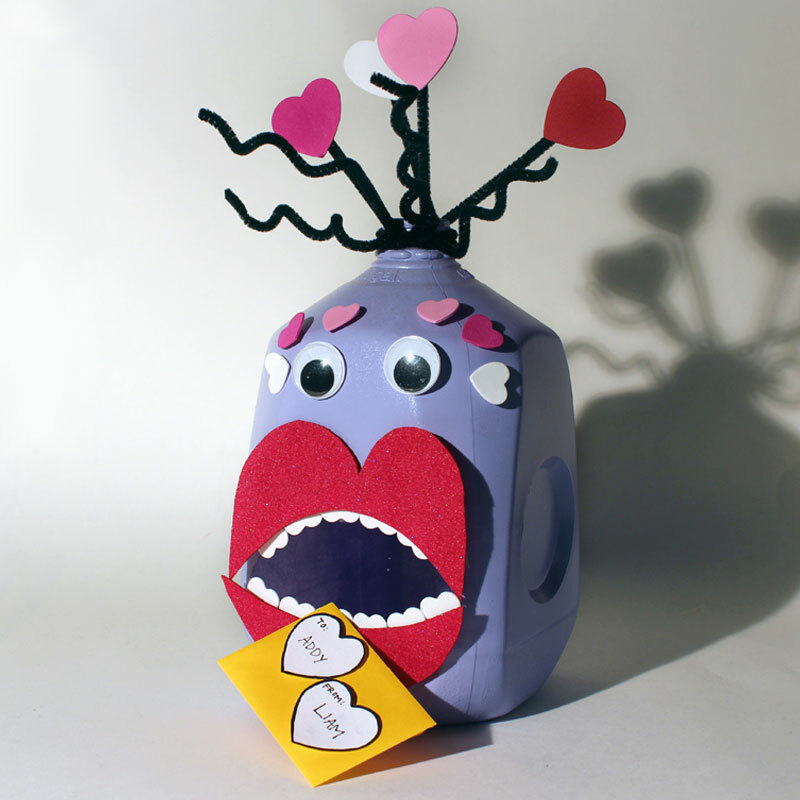 We’ll show you how to make a fun, unique and inexpensive “Love Monster” Valentine’s Day Box using a milk jug and a few simple craft supplies. Paint entire jug with two coats of spray paint in your preferred color. Allow to dry completely, at least 24 hours. Using a craft knife, cut out a hole for the mouth of your monster. Tip: Be sure to make the hole big enough for the Valentine cards to easily go in and out of. 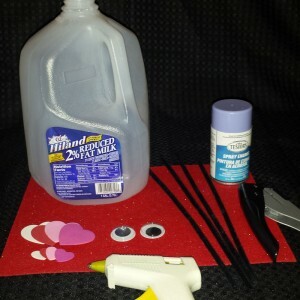 Using a hot glue gun, secure googly eyes and foam hearts around eyes on jug. Tip: Use scotch tape to mock up the layout of the eyes and hearts before securing with the hot glue gun. Using a hot glue gun, secure foam hearts around mouth hole to make the appearance of teeth. Using scissors, create lips out of felt. Tip: Create a template for the lips using a piece of plain paper to outline the mouth hole in jug. Draw lips around the hole, making sure to cover the foam heart teeth points, for a perfect fit. Using a hot glue gun, secure felt lips to foam heart teeth and jug. Using one hole punch, punch 2-3 holes in the mouth of the milk jug where the lid would be screwed on. Secure pipe cleaners to milk jug mouth using punched holes to create hair. Tip: Curl random pipe cleaners around finger or pen to create wacky curls. Using a hot glue gun, secure foam hearts to pipe cleaner hair. This can be created in a couple of hours (not including drying time). If you already have basic craft supplies, the project will only cost about $5.00. Not bad for a fun and unique Valentine’s Day Box, don’t you think!